A year ago I didn’t follow Roscoe Mitchell with the fever or manic nature I followed other artists. But the half dozen or so albums I had of Roscoe held their own within my ever growing collection. Between Art Ensemble of Chicago and the endless group formations Roscoe has led, his discography has always intimidated me. As someone who finds an artist, and dives deeply into their world, I had, and still have not been able to give Roscoe the time and ears he so rightly deserves. But in early 2013 Roscoe released Duets with Tyshawn Sorey and special guest Hugh Ragin on Wide Hive Records. Since anything involving Tyshawn is an immediate purchase for me I jumped on it. It was love at first note. And so began the plunge into Roscoe Mitchell. Fast forward to February 2014 and Conversations I. 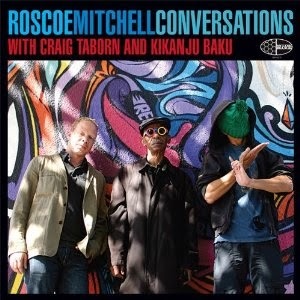 With Conversations I, Roscoe Mitchell releases his second album as a leader on the Wide Hive label. Teamed up with Craig Taborn on piano, organ and synthesizers and Kikanju Baku (who?!?!) on drums and percussions, Roscoe, at the tender age of 73 delivers again. Roscoe has always used space and silence almost as much as he has sound. A feature of his sound since his AEC days I expected much of the same. With little pre-release info, and no sound samples to give me any clue as to what to expect, I inserted the cd and excitedly pressed play. Track 1. Knock And Roll. Instantly came the trademark sound of Roscoe. Sparse and dissonance. Slowly building, Taborn and Baku inserting ideas here and there. Engaging and what I expected. Then around the 1 minute mark, Baku starts to really get going. This led to more from Roscoe, while Taborn interjected notes around the percussion and reeds dance. And then all hell breaks loose. An absolutely unexpected and delightful free-for-all in sound. Bells, horns, drums, and piano exploding from my speakers. For the next 6 minutes I was left breathless. I was actually concerned with getting through the entire album because I had not mentally prepared myself for the onslaught. And suddenly at the 8:16 mark it all stops. Track 2 starts. Ride The Wind. And we are back to the Roscoe I’ve grown accustom to. The rest of Conversations I, plays out as expected with a Roscoe led album. For the next 9 tracks the music bobs and weaves, slowly building to a crescendo of noise at track 9, Darse only to lovingly slow and end on the final song Last Trane To Clover Five. After the initial shock of Knock And Roll the album falls into place and becomes a standard, as if anything Roscoe does is standard, addition to his his ever growing discography. In all, Roscoe once again delivers, Craig Taborn displays his connection with Roscoe, as well as his ability to play the perfect supporting role. The unknown here was Kikanju Baku (literally his face is covered in all images), who I had never heard before. After the opening track it was surprising and pleasant to hear Baku play delicately and in-tune with the rest of the trio. Kikanju Baku should be a force within the free jazz world and I’m looking forward to more of his contributions. His addition made this album stand out to my ears. In April, Wide Hive is slated to release Conversations II, and I am eagerly anticipating it. For a collector who prefers a physical medium, the album comes in a digipak case. Very little info is provided but the packaging, as was his Duets release, is beautifully done. Sound quality is top notch.